Every so often I get an SMS from Standard Chartered with them offering some of their new service or their next big event. Not even having a bank account with them, I find this intrusive and unwanted. Contacted them vai the “Contact Us” link on the Brunei Standard Charted website. Let’s see what becomes of it. Wife has a loan and she was overseas, so I tried to get some information about prepayment and some extra details. They said they couldn’t give it out the details of the loan payment scheduled or even how the amounts were calculated. Took several visits to finally get a print out of it payment schedule from which I had to manually figure out how they did the calculations in order to gauge different prepayment options. After doing the calculations, we asked regarding a loan prepayment and never got a response back. While I may never know the real answer, the skeptic in me thinks of a straight forward answer that they are told to delay things like this so they can make more money out of us. Back in December, finally sent a prepayment request which is still pending approval. What kind of approval is needed? Followed up with the loan office and was told that ‘it was sent for approval’. Comes back to the notion of delays to get more money out of us. While it is not a person physically doing the hanging up, after making the appropriate selection on the automated phone system, it rings once or twice and then just hangs up. Who are we supposed to contact, if the number provided doesn’t even enable us to get in contact with a live person. Perhaps its been one of those weeks that are physically short but mentally long and draining, but Standard Chartered has not been good to me and somebody needs to know. Is this a rant? Probably. Are the scenarios made up? I wish they were. Is Standard Charted a good bank? Not in my experience thus far. What do I hope to achieve with this? Some venting. Also a weird wish that Standard Charted will in get contact with me to sort it all out, but more importantly, to improve their service. But whatever happens, for the time being I’ll have to live with the annoyances of SCB in my life. Here’s to hoping it doesn’t have to be a long term thing. 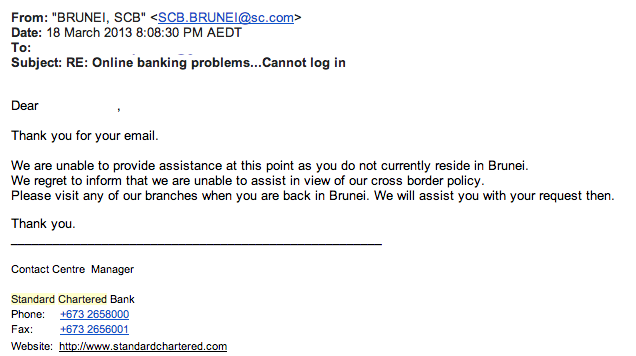 Update: Seems that we have go actually physically visit Standard Chartered in order to get it sorted out. Not exactly an easy option to just fly in to sort it out, but I guess there isn’t really much of an option….